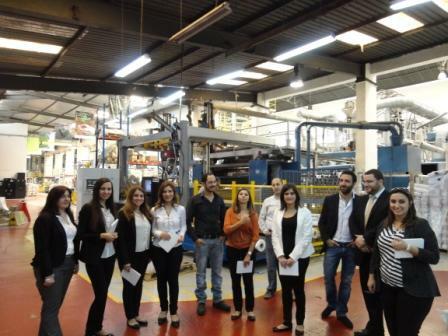 Masterpak hosts Saudi Basic Industries Corporation (SABIC) team at plant in Zouk Mosbeh, Lebanon. On 26 April 2012, SABIC representatives met with Masterpak team to strengthen the business relationship, providing a setting for the teams to get better acquainted. SABIC, one of the world’s largest petrochemicals manufacturers, supplies Masterpak with raw materials to produce its wide range of customized co-extruded polyethylene (PE) films and bags. 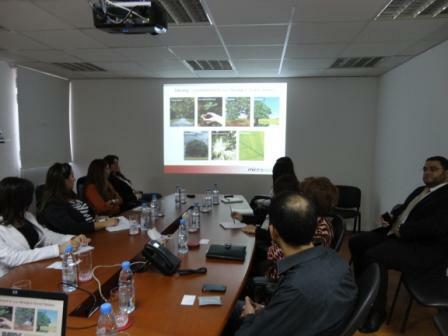 SABIC team gathered in the conference room, where Najah Daccache, Masterpak General Manager, presented the company’s corporate presentation. The team then toured the plant with Masterpak representatives Imad Njeim, Plant Manager, and Nayef Ghaith, Production Manager, as well as Bassem Karam, Supply Chain Manager, and Marie Ghazal, Procurement Coordinator. Sister company Micro Epsilon, masterbatches and additives manufacturer, also partook in the visit, represented by Tony El Chayeb, Operations Manager. Established in 1976 by Royal decree, SABIC manufactures chemicals, performance chemicals, polymers, plastics, fertilizers, and metals. The Saudi-based manufacturer is the largest non-oil company in the Middle East. The company operates in over 40 countries. Masterpak, established in 1974, manufactures customized co-extruded polyethylene (PE) films and bags. Masterpak serves the agricultural and horticultural, beverage, building and construction, catering, chemical and petrochemical, food, household, hygiene and tissue disposables, industrial, pharmaceutical, soap and detergent sectors in Europe, the Arabian Gulf, Middle East, Africa, Asia, America and Australia. Masterpak is a member of the multinational INDEVCO Group.